Vehicle wraps are generally done by smaller local companies. If you’re interested in wrapping a car or truck, you can easily find these local vendors via Google, or you might try this dealer locator provided by Avery Dennison. We’ll be happy to provide graphical assets for the wrap. Greg Weinstein, exclusive licensee in the Sarasota (FL) area, found a company that will wrap a used U-Haul truck and lease it to you. Check out Greg’s first truck – a virtual rolling billboard! Here’s a wrapped Ford F-150 owned by licensee Andre Robinson in San Bernardino (CA). Andre said he paid $2,700 for this wrap. This is a new design (Dec 2016) created for Jared Rogers and Garfield Duncan in North Carolina (Triad/Charlotte) for their new Mercedes Metris. They decided to put extra emphasis on the .com with this alternative version of the logo. Garfield tells us this wrap above cost them $2,400 including the design. This is a modern, sleek design created for Matthew Jones in Colorado Springs, CO. This wrap has unique stylistic elements that give the design a clean look. 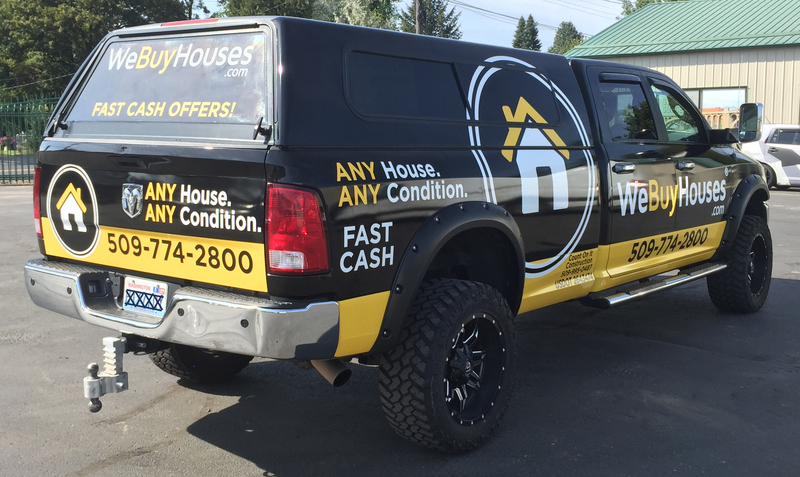 Below is a truck wrap from Peter Curtis at the We Buy Houses Sacramento office. The flames sure grab a lot of attention! Here’s a wrapped car and a wrapped van outside of the We Buy Houses Sacramento office. Car wraps are generally provided by LOCAL VENDORS that you can find via a Google search. At the corporate office, we will assist you by providing graphic design elements (logos, colors, fonts, etc.) to the local car wrap vendor you hired for the project. “Pricing varies by vehicle type. Pickup trucks with a single cab may be as low as $1400.00. Extended cab trucks will be more – around $2,100 to $2,400.00. And please let us know if you need assistance getting YOUR car or truck wrapped!